Roll flatware and create attention-grabbing place settings easily with this Choice WrapNap 15 3/4" x 15 3/4" 1/4 fold 2-ply white dinner napkin. Shipped flat in an 8" x 8" square, this napkin enables you to quickly wrap silverware in napkin bands (sold separately) for a seamless presentation. Thanks to its large 15 3/4" x 15 3/4" unfolded size, this napkin covers patrons' laps during dining and prevents stray food from falling onto your polished floor. We love all the WS Choice products usually you know you are saving money, but all their napkins are solid and hold up really well, Love these 16x16 inch because they look great and we get great feedback from guests. These napkins are a great product at a good price. They are the perfect size for rolling silver ware. They look very classy and hold up well. Fantastic napkins. I'm pretty picky when it comes to napkins because I hate when they are so flimsy they break. I bought 3,000 for my wedding and they were simple and economical. These napkins are great, I like them so much better than my last napkins. These napkins are very soft and clean very well. Highly recommend. These are some pretty cheap napkins and they work great for minor uses. Don't get too attached to them cleaning up major spills, but that's for more expensive items! Nice napkin for the price. We use these to roll a knife and fork in with a napkin band. They have a nice texture and we will buy again. These napkins are very nice and the price speaks for itself. The napkins are an excellent value if you want a thicker and stronger napking. Great dinner napkin size. Love that they are pre folded. Saves precious time when setting for a job. They are also thick enough were they do not fall apart. Great napkin for the money. It's larger than luncheon napkins and attractive. Very reasonably priced as well. In fact we buy these for home use as opposed to the cheap store bought ones that are much cheaper looking. Im really please with these napkins. I will be using them to wrap silverware for my wedding. They are the perfect size and extremely soft. They do not tear easily and are very durable. Would highly recommend this product to anyone, whether a personal event or restaurant. These Dinner Napkins are real sturdy and are a fantastic size for a Dinner Napkin!! The fabric of the napkin is extremely sturdy and holds up very well! GREAT PRODUCT!!!!! The Choice 16" x 16" napkins are terrific and make a great napkin for our tasting events at our sweet shop. Great price and very pleased with their quality. Here again, perhaps I did not read the information on these napkins properly. They were much thinner and lightweight than I expected them to be. Thank you for the review Karen Velez . We’re sorry this has not worked well for you. For an alternative that might better meet your needs, try this Creative Converting 59000B White 3-Ply Paper Dinner Napkin instead! Luxurious napkins. Your guest will only need 1 of these to complete their meal. Also the generous size make wrapping your silverware really easy and creates a professional look. Actually, very good. I do like these napkins. They are very large (unfolded). They do tend to fall apart during use though. Have a premium feel, and look. These napkins were of a great quality and were very large. I used them for our bridal shower and was very pleased with them overall. Large size napkins. they were much larger than what I initially needed them. They were used with my smoothies and soaked up minor spills easily. Nice simple napkins these napkins are similar to the ones you see at a diner nice and very high quality. 5 Stars out of 5! Great quality and for silverware that is rolled this is an absolute must. The cost is better than ones we've used in the past and it makes rolling silverware a breeze by not having to unfold napkins. For the price you would not expect such thick, quality napkins. 2-ply is an understatement. Quality thickness can clean up decent spills. Great quality for the price. These are very high quality for the price. I was expecting cheap and thin napkins, but these are thick and strong. My customers at my food truck love them! We ordered a couple cases of these from time to time and the quality each time changes. The first couple orders, the quality felt really nice-like smooth felt paper. The subsequent orders the paper quality became thinner and drier. It's not a deal breaker, but definitely nice to have the same quality of paper napkins every time we order. These are nice quality napkins. We keep them in clear napkin holders on our cafe tables and they add to the nice look of the tables due to their good quality. These napkins were very high quality for the price. They folded well and looked nice on my table for a family dinner. Would definitely recommend and repurchase! These napkins are good quality and are big enough for the average person. The 16x16 size is perfect if you need to roll silverware in them for an event. We love these napkins. We wrap our new forks and knives in them to look more professional at the restaurant. We are fast casual but we like this look alot better and these napkins are first rate. Very large napkin, good quality for the price. Nicely presented, this look much better than the grocery store napkins we were purchasing. Happy with the quality and quantity. These napkins were great! We used them to wrap our silverware for our buffet as well as stacked them as extras! Will be buying again! These dinner napkins are a perfect choice for home or commercial use. We like them for catering because the white is a very stark white. The Choice WrapNap sixteen inch by sixteen inch two hundred and fifty pack of two-ply white dinner napkins has met all of my expectations. I was pleasantly surprised at their durability, and that they do not feel flimsy at all. I was impressed the bright white color did not look like a dirty white as with other brands I have used in the past. I would definitely order them again and hope for additional sizes in the future. A nice quality white napkin that are a great value. Perfect for fast food and small diners. The choice 16x16 are the perfect size and very strong. Another product for our faculty's pay day treats that has worked well in addition to the plates and cups we purchased. They're an appropriate size for what we need. These napkins are great. When I first read a few reviews, I was skeptical that they might be a little too cheap but decided to give them a try. I accidentally purchased a case instead of the pack of 250 that I thought I was purchasing. But, the good news is that these napkins are not cheap. I love the quality. I also love the fact that they came packed in individual packages, which allowed us to store them nicely on our shelves. We use them regularly at catering events. This was a great purchase and we are pleased. A light and thin napkin that is large enough to wrap up silverware if desired. These are ok for outdoor luncheons and takeout. I would not buy for nice events or parties. These dinner napkins are excellent. They cheap enough for store use but fancy enough for catering. We've wrapped them around knives before and that works as well. These feel pretty cheap. I was hoping for a bit more out of them, but they aren't terrible. The second ply falls off pretty easily, but overall if used folded, they are pretty good. I am actually really surprised by all of the good reviews on these napkins! Yes the price is good but the napkin is terrible and you end up giving guests many more than usual to get the job done. They roll fine, but the feel is just like a tissue and hold up about as well. This is not a practical napkin but great if you need to blow your nose! We are sorry you did not prefer these napkins, Brooke! For a sturdier, more linen-like option, try these Touchstone by Choice 16" x 15" White Linen-Feel Flat-Packed Dinner Napkin instead! For the price i guess i can't complain much. I purchased to use at a pig roast and unfortunately these were just too thin and fell apart with any kind of wetness. They would work fine for a lunch napkin with dry foods or sandwiches. but for sauces and gravy, they just didn't do the trick. The price is great for how many you get though! great napkins here. we use these to roll silverware. holds very well. we put a knife and 2 forks and its perfect. will order again of this product. These napkins feel plush and thick and were perfect for my needs. They did not have the crunchy feel of cheaper napkins, but felt like I should have paid more for them. A very good buy. Not great but better than some of the others I tried. They seem like they would be good because they are 2 ply but once wet they shred like toilet paper. Good quality 2 ply dinner napkins. They come flat to save time wrapping silverware. Soft texture. Somewhat thin but decent for the price. Overall good product for restaurant use. Love these napkins. We use them to wrap our utensils and they work great! They are durable and the fact that they are not folded in half is a huge time saver! This is a big soft napkin. You can wrap your silverware with it. It's not too rough at all and it's thick. It's a good napkin. These are excellent napkins and also a excellent value. They are large and thicker so absorb well. I bought these to use for a fund raiser and also for school lunches, so you have kids from 7 to 17 using them and they hold up very well. These napkins have a nice feel to them. They are especially nice for wrapping silverware in our restaurant. Our customers compliment the feel of our napkins all the time! Great feel, thickness and quality. We use these napkins to wrap our silverware in and when paired with the napkin wraps make an elegant presentation. Solid napkins here nothing too fancy or flashy. Solid white and absorb well. Napkins dont tear or ball up when faced with a spill which is great! These high quality dinner napkins are great for wrapping silverware without having the extra step of opening up a 1/8 fold napkin. Add the optional napkin bands to really complete the package. The price for these napkins is fantastic. 250 napkins, 2 ply so the quality is decent. Basic white so we can use them in almost any setting. These are true very good napkins for dinner. These are made of a nice quality paper and the size is perfect for a dinner napkin. If I could give zero stars, I would! This is a useless piece of paper. If your hands are wet, it shreds on your hands. If you roll silverware with them, you must use two or three. I will never order these again and wish I could replace the ones I threw in the trash because they were so useless!!! Thank you for the review, James. We would like to know more about the issues you're having with these napkins. We will be contacting you soon! Great the colors was dead on with what I needed them for my customers was very pleased with their out come of the wedding veery good pricing! Perfect for my event, these napkins are heavy duty. I rolled the knife and fork in them and the presentation was stunning. Almost looked as if they were cloth napkins. I'm very happy with this purchase and will buy again for my future events. I ordered this to wrap the disposable cutlery and it hold up very well. it is strong and of good width. thank you for this remarkable product. These have a great feel and thickness, and will be perfect for our wedding where we're serving BBQ and using mostly disposable items. Much better than the cheap paper napkins the BBQ company is providing. These are the best napkins for any event large or small. They are very thick and durable. I used them for my wedding and a lot of my guest (family) asked where did I get them from. Very nice product a must have. Great size napkins. Absorbent and sturdy. Good price on them for sure for the amount you get. Would recommend this for sure to other people. I was running low on funds and napkins one week and decided to order these. The napkins are priced cheap but I was happy when I received them and they were of decent quality. This is great for what we use them for, food truck guests! Nice napkins, great size and thickness. If you have a party with lots of kids you need to buy these. Great price you won't find a better deal. These are a huge time saver if you wrap you napkins around your silverware. They are already unfolded so it saves time and money. The only problem I have had is that once in a while you get a hiccup in the stack of napkins. Either they are triple thick or accordion folded or have pieces of torn napkins. This happens infrequently, but I wanted you to know, hence my 4 stars instead of 5. The napkins are a great quality and are soft. These napkins are nice. I think they would be perfect for a fast food restaurant. I've had no customer complaints, but I prefer something a little thicker. They do tear easily. These napkins were large enough to wrap around the flatware pieces. The paper is not as soft as some napkins, but the price is right! These napkins are great for pre wrapping utensils for catered events. They are just the right size to accommodate the cutlery and are sturdy enough to survive being handled. This is a great napkin. We rolled the silver visions plastic ware with this napkin and wrapped them with the white self-adhering napkin bands for my daughter's outside wedding. A very good value for the task, which is, provide a decent quality napkin for our dance studio dinner concerts. We serve a buffet and try to have restaurant (not fast-food) grade consumables. Which reminds me, I probably need to order more. Very generously sized napkins that are perfect for rolling silverware. The quality is fantastic as well. Will definitely buy them again in the future. Five stars!! I ordered these to use for my outdoor wedding. These are good napkins that hold up to the mess. I also had a bunch leftover and have been using them for everyday use. Great napkin and good price. It could be a bit thicker...I'd actually prefer a thicker 1-ply vs two thinner 2-plys. As others have mentioned, it's the softest napkin I've ever felt. It's as soft as a two ply tissues. That said, I continue to order it because you can't beat the price; however, theres a few things they could do to make this product even better: improve the embossing (it's pretty minimal) and thickness/softness. I ordered this napkins in order to wrap 250 utensils for a party I am having. The only complaint I have is that they were vacummed packed so they were a little wrinkled when I opened the package. Not a huge deal but I am OCD and it bothered me that they werent wrinkly free. But they are great for wrapping and of good quality. Great value for money but I was a little disappointed with the quality - a first for me with webstaurant - they are a little more flimsy than i would have liked. My sister in-law purchase these napkins for her daughters graduation party I was so impress i ordered them for my ball and i will be ordering them again in a few days for another Ball . Thanks for such a great inexpensive product. These Choice 2-ply napkins are big and work great for wrapping silverware sets. They are durable and customers love them. Will order again when we need them. These are high quality full dinner napkins. The 4 quarters folded type, similar to expensive brand full napkins. I really like them and they are a classy offering. We use these for out silverware to wrap them up and then we use a napkin band to hold the silverware in a tight roll. Great product! These dinner napkins were great for our picnic. There were a handful that had folded or crinkled edges, but that happens with shipping and you can easily use that corner as the start when wrapping- once wrapped you would never notice! These napkins are great! They are large napkins and are very sturdy. We used them for dinner napkins for our wedding and were very satisfied with the durability. They can be used to wrap silverware also. I use these napkins at home, they are perfect. It flawlessly cleans the mess we make, hahaha. I also used these for a family event, it was amazing. these wrapnaps are top of the line when it comes to dinner napkins. great strong napkin at a great price. the customers really like the feel of the napkin and we love the price. These napkins are so big and strong. They were easy to wrap around the utensils and worked perfectly with the adhesive wraps. I tied twine around each one to add a rustic feel. The system for using these napkins is very nifty. A motivated employee can very quickly wrap up flatware. However, I would prefer a slightly heavier napkin. I was looking for a high quality napkin for time saving and to hopefully reduce the number of napkins we use. This napkin turned out to be a lower quality than I was looking for (the ply is actually so thin that it is difficult to grab only one at a time when rolling) but the price is good if you can get the shipping down. We do a lot of wings, ribs, messy stuff...so, I will not repurchase but might be worth trying for you. I\'m still looking for the perfect napkin! Thank you for your review! These napkins are a great value. If you need heavy weight napkins for foods such as wings, try the Marcal Eminence Bella 2-Ply white dinner napkins instead! A very high quality napkin and the price is exceptional, no more customers asking for extra napkins while enjoying their meal, these napkins set the standard!! Very nice and large paper napkins. Perfect for rolling dinnerware and banding. Sturdy enough to hold up for whatever needs wiping. Use for bar or dining room. Great napkins for the price. They are thick, absorbent and cost effective. They do shed but not as much as other lower priced napkins that we tried. These wrapnap white dinner napkins are great! We roll our silverware in them and tye them with a ribbon to make them look like graduation diplomas. So glad that I found restaurant quality napkins. These are the perfect size for pre-rolling silverware for our event. The value was excellent as well. These napkins are a great value, you get more than what you pay for with these. The quality is good, the thickness is great and they are durable enough for the everyday use. These Napkins Wrapped around three pieces of plastic flatware easily. I wanted to wrap over 150 sets of flatware for my twenty fifth anniversary party. Since the napkins are large, I didn't need help getting the job done quickly. The napkins are large enough that the guests will probably not need more napkins either. They are the economical choice ! Great napkins for rolling silverware. We used these for a recent employee banquet and they added nicely to the table presentation. We placed extras on the serving tables, but few people needed them. I would give 5 stars, but a few of the napkins were creased and ripped so they were unusable. Great for rolling silverware. Higher quality and half the price compared to all my food vendors. Why pay more for less and lower quality napkins. These napkins were awesome! Had no problems whatsoever with them. They are large and thick. Your guests won't need a second napkin. Affordable and great buy! Buying more! We love these napkins. The servers save time when rolling the silverware and they are a nice color and thickness. We have reordered several times. At my church we used these for the dinner to honer all the ladies. the napkins were very nuce and worked very well with the utensils wrapped and the napkin bands. i was very happy with them. I am very happy that I purchased these napkins. They are easy to use and fairly thick. I do plan to purchase more in the future. Great napkin for wrapping flatware. It is so nice to have a large flat napkin to use that doesn't require to be opened up to wrap flatware. Very Good Item makes your silver wear look professional and very good price comber to other suppliers and I always buy more to save more. 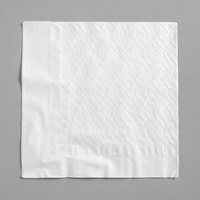 These are great basic napkins for wrapping sliverware with or to simply use as plain napkins. I love having a case of these at home, sure to last. The 2 Ply 16" x 16" WrapNap White Dinner napkins Flat pack sold 3000 per case. They are perfect for wrapping our silver ware, or just using as napkins. The 2 - Ply 16" x 16' wrapNap White Dinner napkins Flat pack sold 3000 per case. They work great for wrapping our silver ware. Price is right. These are the perfect napkin to wrap silverware with like so many restaurants do. Im not sure if they fit in standard napkin holders however. These white napkins are the best for quick wrapping of silverware! Silverware wrapped in these napkins are easy to store!!! They are high quality and affordable!!! Need a great quality dinner napkin? Then these are for you! These two-ply napkins are the best we have used in our four years of business. You will not be disappointed! These napkins are delivered flat so that it's easier for the staff to quickly roll silverware. Napkins hold up well,are good quality, and have a pleasant design. These are excellent dinner napkins. They have a good feel to them, and great absorbancy rate. We use them to obviously wrap our silverware. They hold up well. And are priced to move. These make wrapping silverware really easy. Nothing to unfold and they cover the cutlery completely. Thanks Webstaurant store for the quick delivery! Will buy again. Very high quailty, great price. I would highly recommend for any type of restaurant. I will reorder again. Next time will get wraps to go with them.